How to Wear Shorts in Winter. When it comes to winters, dressing up may seem fun but according to a lot of people wearing short dresses is a big no! But many women believe the contrary; they are bold enough to carry shorts and skirts in winters. They simply don’t believe in restricting themselves to fully loaded clothes, of course they wear clothes to keep them warm but they experiment with even short dresses. Shorts and winters, seems the wrong combo, no? Well, think again and again, it’s the coolest combination to carry. From casual to formal, it can be dressed according to your style and the event where you want to wear it to. 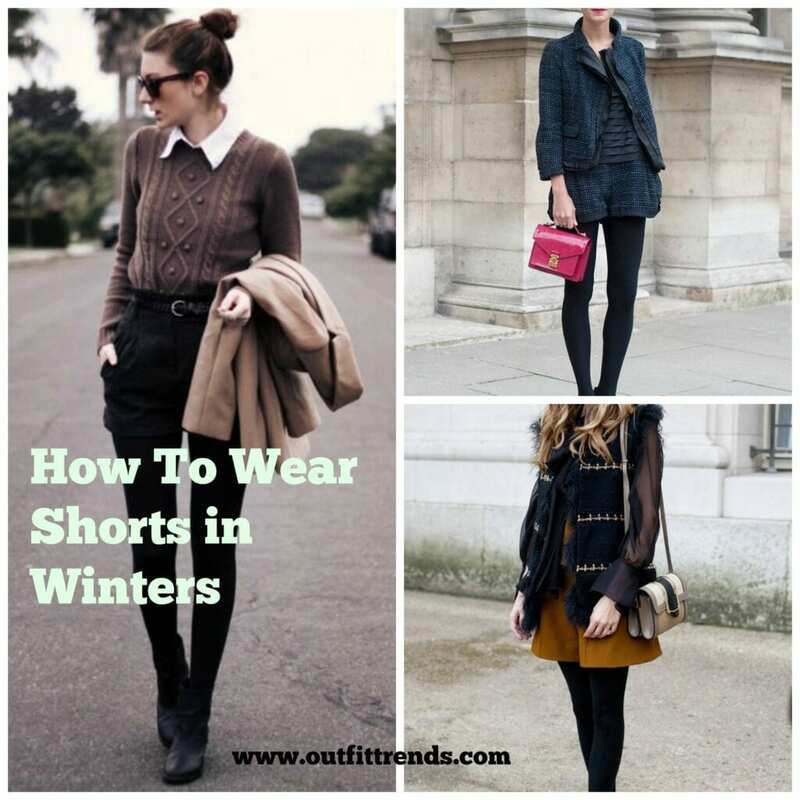 We bring you 20 most interesting ways to wear shorts in winters. Look # 20: Everyone Loves Black! Go all black, wear a blacksweater and pair it with black shorts to give an edgy look. For more black outfit ideas, have a look at these Outfits with Black Jeans. Simply adding a belt to shorts and sweater is also another way to pull off shorts, its perfect for autumn and winter days. Another thing is to experiment with shorts. Wear buttoned shorts to give yourself a more casual but hot look. To keep you warm wear cardigans and combine them with tights and shorts. This can be an everyday casual to office wear. Also check out these Perfect Monday outfit for school & College in Winter Season. An easy way is to pair up the shorts with denim jacket, this will not only keep warm but also give an effortless look. Look # 14: Jacket and Scarves, Always! For winters, pair up denim shorts with leather jackets and scarf to keep you warm. For footwear there are many options available. Combine your shorts with fancy tights; this instantly uplifts the entire dress code. Another great way to pop up the dress is to combine it with floral shorts; in this case you can also wear bright cardigans which are perfect for winters. Another good way is to wear stylish jackets to keep warm and wear them along denim or leather shorts. Some women still may be skeptical about shorts; they can do a lot of layering for top in their dress to keep themselves warm. For winters another great tip is to opt for leather shorts than regular shorts as these are much warmer. Here we also see Miranda Kerr carrying her leather shorts in winters! Look # 8: Long Coats for The Win! Pair your shorts with long coats; these are much beneficial as they keep you warm almost till knees. If you prefer funky fashion then wear printed shorts with plain tees or tops and combine with coats or jackets. Scarves and sweaters are everyone’s favorite in winters. So wear them with shorts, for foot wear women can wear long or short boots and complete the look. One of the most perfect ways to formalize the dress is to wear a suit which comprises of shorts. Who says shorts are for casual wear? Wear a proper suit for office or formal events. Look # 3: Trench Coats Will Keep You Warm! Similar to long coats, trench coats are also a good way to keep warm if worm over shorts. Capes are an absolute favorite style statement and surprisingly they add loads of layers and go well with shorts too. If you like this style then you’ll love these Cape Outfit Ideas – 25 Stylish Ways to Wear Cape Fashionably. Look # 1: Woolen Clothes for Winters! The best way is to wear a lot of woolen and heavy textured tops with shorts to keep yourself all cozy in winters.